M-Sport have further extended their lead at the top of the World Rally Championship with Ott Tanak winning Rally Italia. It was the Estonian driver's maiden victory in the championship after what team principal Malcolm Wilson described as a "fantastic drive." The Dumfries driver won a thrilling event in Dumfries and Galloway, one of the UK's best rallying locations. M-Sport's Sebastien Ogier extended his lead at the top of the World Rally Championship with a second place finish in Corisca. The Frenchman recovered from an electrical problem to overtake Dani Sordo in the final test of the rally. The Cockermouth rally giants added more points to their tally with their number two driver, Ott Tanak, finishing in fourth position. There was mixed success for local drivers at the Border Counties Rally in Jedburgh. Scottish Rally Champion Jock Armstrong has thanked the thousands of fans who turned out to watch the Border Counties Rally this weekend. Armstrong, from Castle Douglas, retained his title in the Scottish Rally Championship, while Fredrik Ahlin and co-driver Torstein Eriksen won the Borders stage of the British Rally Championship. There's a lot of people there and you could see some areas where there's masses of crowds there today. So along with the British Championship you knew it would pull a lot of numbers in so it's very good for the area and the community. 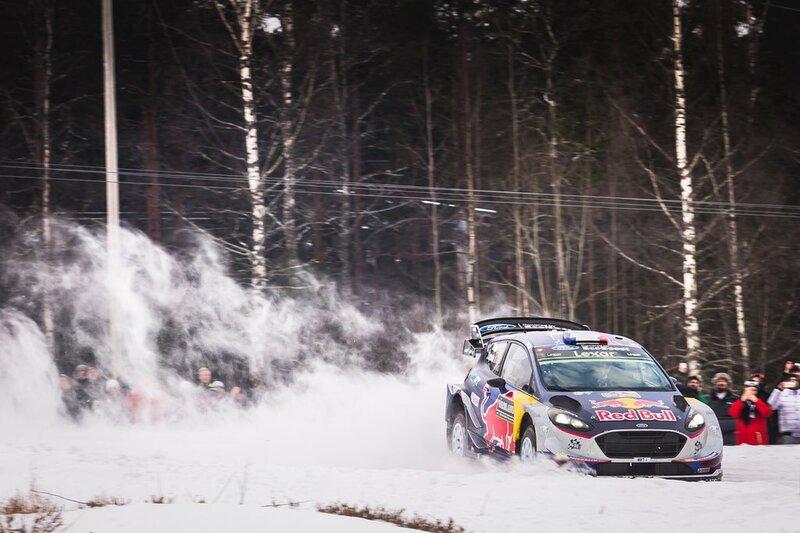 M-Sport World Rally Team continued their successful start to the WRC season with a double podium at Rally Sweden. The Cockermouth team's top driver, Sebastien Ogier, was in strong contention for the overall victory throughout the rally. However, he had to settle for third place after losing out to Jari-Matti Latvala, who gave Toyota their first win after a 17 year absence from the WRC. But it was Ogier's Estonian teammate Ott Tänak, who managed to take the second spot on the podium. Rally Sweden is renowned for its treacherous driving conditions, with the majority of the rally taking place on snow and ice. It's been announced that the Border Counties Rally will host the first round of the British Rally Championship. The Jedburgh-based event is already a firm favourite on the calendar of the Scottish Rally Championship, but after the cancellation of the Mid Wales Stages, organisers have decided to use the Borders event as the season opener for the elite British series. It's expected that the event will bring a welcomed boost to the region's economy, with thousands of spectators expected over the weekend of 18th March. A strong contingent of local rally drivers will be among the favourites to win the event. These include reigning Scottish Champion and Castle Douglas driver Jock Armstrong, Duns driver Garry Pearson and 2011 British Rally Champion David Bogie from Dumfries. Staff at M-Sport's rally headquarters in Cockermouth have been celebrating, after it was announced the team has signed four times World Rally Champion Sebastien Ogier. Team boss Malcolm Wilson sealed the deal after the Frenchman spent time testing their new car - and he's confident they'll be the team to beat next year. Pictures courtesy of M-Sport, Tom Cave and Red Bull/WRC.